Shows how being part of the church is to be selected by God through Christ to show the mystery of God’s electing love. Read a review from the guys at The Gospel Coalition. An increasing number of people think of the Christian faith primarily in terms of themselves as individuals. Faith is not only a personal but also a private matter. For these believers, church has become an optional extra, a matter of convenience and personal choice. In his letter to the Ephesians, the apostle Paul says a firm “no” to this idea. The church of Christ far from being an optional extra; it is the display of God’s wisdom to the universe! The church is God’s handiwork, made up of people from every conceivable background, living under the gracious rule of Jesus himself. To be a part of the church is to be hand-selected by God through Christ to make visible the mystery of God’s electing love. In short, Christianity is far more corporate and public than we might first expect. We are redeemed as individuals, but we are placed in a family. And living out the Christian life requires we live together with others who love the same Lord. It requires we actively participate in the church, for the church is God’s only plan to raise us to full maturity in Jesus Christ. The ten studies in this Good Book Guide will help groups and individuals discover the richness of God’s grace towards His people, and grow as the body of Christ. 5.5" x 8.3" x 0.4"
"The format is very user-friendly and the content is rich and accessible." "God-centered, application-oriented, and driven by the text throughout, this resource is a gift to God’s church." Here at Covenant Life Church, we have greatly benefitted from the small group resources from The Good Book Company. Many small groups in our family life ministry have used "Colossians: Confident Christianity" in their study of scripture. Additionally, our youth ministry has used "Romans 1-5: God and You" in their small groups. Both resources were very easy to use, helped the reader engage directly with the scriptures, and had a wonderful pastoral emphasis demonstrated in all the questions. This study is very good for small groups...can be done in about an hour (or just over). The studies deepen your understanding of the bible and how we should live as Christians. I have been challenged through these studies and I'm always excited to delve deeper into the word of God. There was a good range of questions that allowed an in-depth study and so we took on average 2 sessions to complete one study. The leaders section was very useful in helping see some of the core aspects in the passage. It also usefully dealt with a lot of alternative views that are doing the rounds but have a faulty basis. All in all an excellent study which helped us better be Christ's people. We've been using this book for 5 weeks so far and each week we've only been able to complete half a chapter because the questions generate so much discussion. The leader's material is the most comprehensive I've come across, within a study booklet. 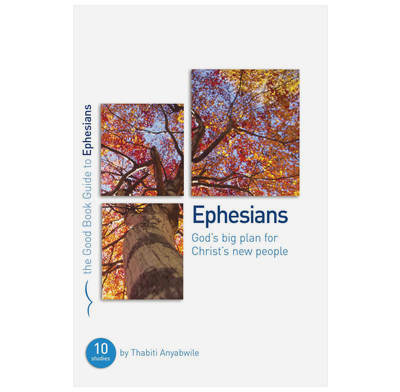 We are now into our fourth week of Ephesians: God's Big Plan for Christ's New People, and our group is really enjoying it and growing as a result of it! We appreciate the way the questions are organized, as our group is not only discussing the Biblical text, but also how the text relates to each of our lives. Furthermore, each study presents a main idea / a "nugget" that we are able to walk away with, as well as incorporate into our prayer time. As the discussion leader for the group, I have also greatly benefitted from the leader's guide / commentary (which constitutes the second half of the study booklet). We will finish the Ephesians study at Christmas, and intend to select another one of the Good Book studies for our second semester. My group is beginning to do a proper Bible study after Alpha. The first study was extremely difficult and so we omitted the second study (on same passage). The third study was very good and we hope that subsequent studies will also be good for this group.